Attia, J.Z., et al. Ultrasound Guided Transversus Abdominis Plane Block versus Intrathecal Nalbuphine Injection for Postoperative Analgesia in Preeclamptic Patients Undergoing Cesarean Section. (2018) J Anesth Surg 5(1): 5- 12. © 2018 Attia, J.Z. This is an Open access article distributed under the terms of Creative Commons Attribution 4.0 International License. Introduction: Post-cesarean section effective analgesia is important, effective pain release helps in early mobilization and declines threat of thromboembolic diseases. The transversus abdominis plane (TAP) block is a regional analgesic procedure with a growing character in postoperative analgesia for lower abdominal surgeries. Nalbuphine, Intrathecal opioids has synergistic effect with local anesthetics and thereby exaggerate the sensory block without aggregate the sympathetic block. Patient and methods: 90 patients allocated as 30 patients in each group, all groups received intrathecal bupivacaine and TAP injection, group S had TAP injection with saline, Group B had TAP injection with bupivacaine, and group N had intrathecal nulbuphine and TAP injection with saline. Preoperative, at induction, intra and postoperative follow up of heart rate, systolic and diastolic blood pressure, total analgesic requirement (nalbuphine) in 24 hours, total I.V glyceraltrinitrate consumption in 24h, motor recovery, analgesic duration, Visual Analog Score (VAS) and effective analgesia time. 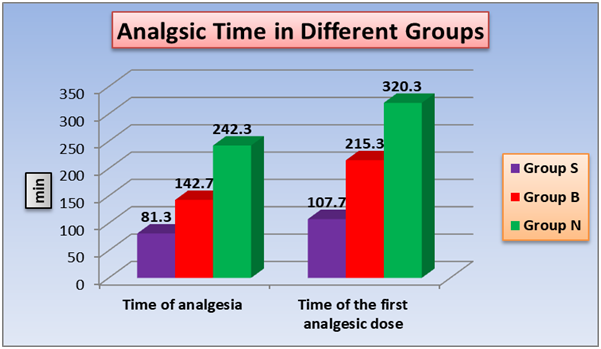 Results: as regards analgesic duration and effective analgesia time, a significant increase in group N in comparison with group S and group B, also in group B compared with group S, while a significant decline in total analgesic dose in group N compared with other groups and by comparing group B with group S.
Conclusion: Intrathecal nulbuphine and TAP block produce a significant prolongation in postoperative analgesic time and decrease postoperative analgesic consumption. However intrathecal nulbuphine showed significant advantages over TAP block. Pain and subsequent anxiety decrease the mother’s capacity and early mobilization. Effective pain relief aids in early mobilization and declines threat of thromboembolic diseases which is public following cesarean delivery. Essentially, analgesic technique should be safe, effective and preclude progress of chronic pain. The transversus abdominis plane (TAP) block is a regional analgesic procedure which blocks T6 – L1 nerve branches and has a progressing character in postoperative analgesia for lower abdominal surgeries. TAP block is safe and simple procedure and is a possible alternative to spinal opioid as an analgesic after caesarean section, whether directed by traditional anatomic marks or by ultrasound. It has been considered to be real in caesarean section and after hysterectomy, open prostatectomy, laparoscopic cholecystectomy, and appendectomy. TAP block would have the benefit of value-added analgesia, a lessening in opioid-associated adverse effects and the absence of motor blockade. Intrathecal opioids are synergistic with local anesthetics and exaggerate the sensory block without aggregate the sympathetic block. They are commonly supplementary to local anesthetics for potentiating their properties, decreasing their doses, and thereby decreasing their complications and adverse effects and offer hemodynamic stability. They also elongate the length of postoperative analgesia. Nalbuphine, a mixed agonist–antagonist opioid, has a potential to attenuate the μ -opioid effects and to augment the kappa-opioid effects. It was produced in an attempt to produce analgesia without the unwanted adverse effects of μ agonist. Furthermore, lumbar neuraxial analgesia reduces pain-mediated hypertensive responses. There are insufficient studies examining diverse analgesic possibilities for pre-eclampsia in women after caesarean birth. Neuraxial procedures, local anaesthetic procedures, opioids, paracetamol and tramadol have not been studied to any significant degree in this population. Non-steroidal anti-inflammatory agents are frequently used as analgesic agents after childbirth, however, these agents have well-accepted adverse effects and contraindications, in addition, particular case reports of hypertensive disasters in pre-eclampsic women. Our study aims were (i) to determine the analgesic efficacy of TAP block and intrathecal nulbuphine, (ii) to compare TAP block with intrathecal nalbuphine. After approval of the institutional ethics committee; 90 ASA grade II sever pre-eclamptic women systolic blood pressure > 160 and, or diastolic blood pressure > 110, with proteinuria and gestational age < 38 weeks were admitted for emergency caesarean section under spinal anesthesia in a prospective, randomized, placebo-controlled trial and printed informed agreement was completed from each patient. All patients under treatment of I.V infusion Glyceryl Trinitrateif sever preeclampsia (systole >160 mmgh or diastole >110 mmgh). If there was a history of relevant drug allergy, tolerance to opiates, basal metabolic index (BMI > 30 kg m-2) at initial hospital visit, or contraindication to neuraxial anesthesia patients were excluded. Patient with Platelet count < 100,000 per mm³, liver enzymes elevation (twice normal concentrations), Renal insufficiency (serum creatinine level >1.1 mg/dl or a doubling of serum creatinine level) or oliguria (< 500 ml in 24h), Pulmonary edema or cyanosis, New detected cerebral or visual disturbances, Continous right upper quadrant or epigastric pain were also excluded from study. Group (S): Thirty patients received intrathecal injection of 2.5 ml of 0.5% hyperbaric bupivacaine, An ultrasound-guided TAP block was done at the end of surgery a total of 20 ml normal saline was injected in each side (left and right). Group (B): Thirty patients received intrathecal injection of 2.5 ml of 0.5% hyperbaric bupivacaine plus, an ultrasound-guided TAP block was done at the end of surgery a total of 20 ml 0.375% bupivacaine HCL was injected in each side (left and right). Group (N): Thirty patients received intrathecal injection of 2.4 ml of 0.5% hyperbaric bupivacaine plus 2 mg (0.1 ml) nalbuphine HCL (Nalufin 20 mg/ml, AmounPharmacutical CO.), An ultrasound-guided TAP block was done by the end of surgery, a total of 20 ml normal saline was injected in each side (left and right). Each patient received an intravenous infusion of 500 mL (100 ml/hr) of saline solution were given via a 16-gauge intravenous catheter and 10 mg metoclopramide intravenously before spinal block. Besides, the loading dose of IV fluids, patients received a further saline solution during the rest of the operation. Only trifling sedative medications were received during the operation (midazolame 1 – 2 mg). Continuous electrocardiogram monitoring and pulse oximetry was included. Baseline maternal heart beat and blood pressure were reached before the lumbar puncture. Patients received a standard spinal anesthetic comprising hyperbaric 0.5% bupivacaine 12.5 mg. patients were put in the sitting position with leaning forward. Sterilization was made. Dural puncture was achieved at or L3 – L4 interspace with a 25 gauge Quincke spinal needle. After approving the precise location of the spinal needle by aspiration of the cerebrospinal fluid (CSF) and after the injection (the spinal volume was injected over 20 – 25 seconds), patients were immediately reverted to the supine position with 15 to 20 degrees of left uterine displacement breathing oxygen via face mask. An ultrasound-guided TAP block was made by end of surgery, skin was prepared with 2% chlorhexidine solution and a high-frequency (11 - 6 MHz) linear ultrasound probe (2.5 cm footprint) (Chison ECO3, Chison Inc.) was used. The injectate syringes were prepared under aseptic technique. Ultrasound probe was situated in mid-axillary line half way between costal margin and iliac crest. The adequate image was designed to visualize the subcutaneous fat, external oblique muscle, internal oblique muscle, transversus abdominis muscle, peritoneum, and intraperitoneal cavity. A 100 mm long 20G short bevel needle (Stimuplex A B/BRAUN Melsungen AG, Germany) was introduced in plane to the probe of the ultrasound anteriorly to lie between internal oblique muscle and transversus abdominis muscle, a total of 20 ml study solution was injected in each side (left and right). Effective injection was achieved when an echoluescent lens-shape seen between the two muscles. 2. Heart rate: Assessed preoperative, after induction, every 10 minutes till the end of surgery and 1 hour, 3 hours, 6 hours, 12 hours, 18 hours and 24 hours postoperative. 3. Systolic blood pressure: Assessed preoperative, after induction, every 10 minutes till end of surgery and 1 hour, 3 hours, 6 hours, 12 hours, 18 hours and 24 hours postoperative. 4. Diastolic blood pressure: Assessed preoperative, after induction, every 10 minutes until end of surgery and 1 hour, 3 hours, 6 hours, 12 hours, 18 hours and 24 hours postoperative. Assessed 1 hour, 2 hours, 3 hours, 4 hours, 6 hours, 8 hours, 10 hours, 12 hours, 14 hours, 16 hours, 18 hours, 20 hours, 22 hours and 24 hours postoperative. 11. Side effects: in form of nausea, vomiting, headache and hypotension were recorded. 12. Patient satisfaction: were assigned by bad, good, very good, excellent response to analgesia. Statistical method: The data are collected and statistically studied using statistical package of social science (SPSS) version 23. The quantitative data expressed as mean ± SD and minimum and maximum of range. The quantitative data are analyzed using One Way ANOVA test between the three groups followed by post hoc Tukey analysis between each two groups. The significant level was taken at P value < 0.05. Sample Size Calculation: Before the study, patients numbers required in each separate group were determined after a power calculation according to data obtained from pilot study. 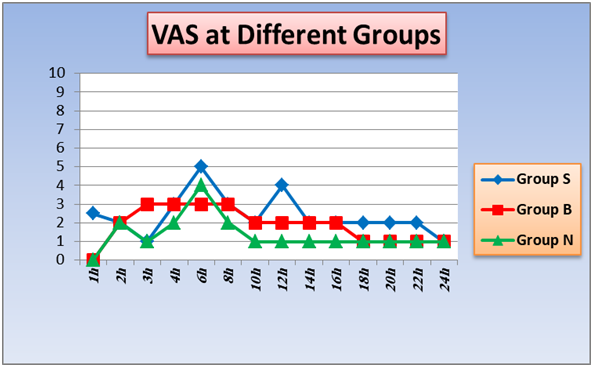 Pilot study reported a mean VAS at 24h of 1.4 in group S, 1 in group B and 1 in group V (with SD 0.5). In each group, sample size of 30 patients was determined to provide 90% power for one way ANOVA test at the level of 5% significance using G Power 3.1 9.2 software. Table 1: Demographic data and duration of operation of the three groups. 2. 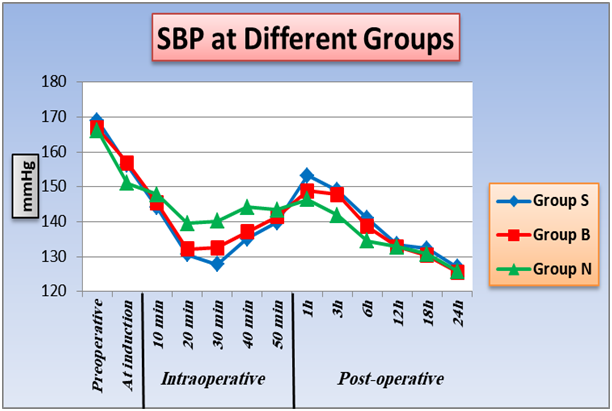 Effect of TAB block and intrathecal nalbuphine on heart rate , systolic and diastolic blood pressure: As regard heart rate, SBP, DBP, differences are statistically insignificant between the three groups at preoperative, induction, (10 minutes and 50 minutes), intraoperative and (12, 18, 24 hours) postoperative intervals as P value was > 0.05. 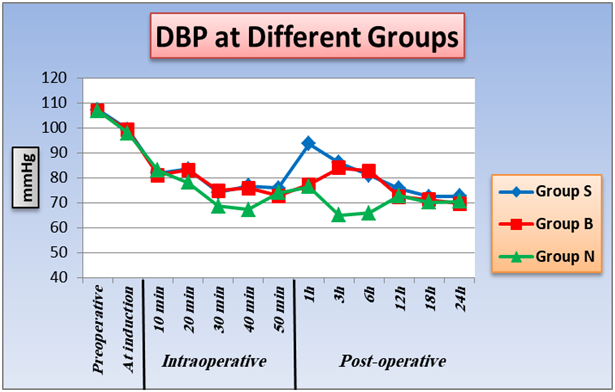 At (20 minutes, 30 minutes, 40 minutes) intraoperative and (3 hours, 6 hours) postoperative, there is significant difference between group B and group N, SBP and DBP were lower in group B than group N intraoperative and higher in group B than group N postoperative, also there is significant difference between group S and group N, SBP and DBP were lower in group S than group N intraoperative and higher in group S than group N postoperative, P value < 0.05. There is no significant difference between group S and group B at P value > 0.05. Furthermore, within the three groups a significant difference at 1 hour postoperative as P value < 0.05, group N was the lowest, then group B, lastly group S was the highest. 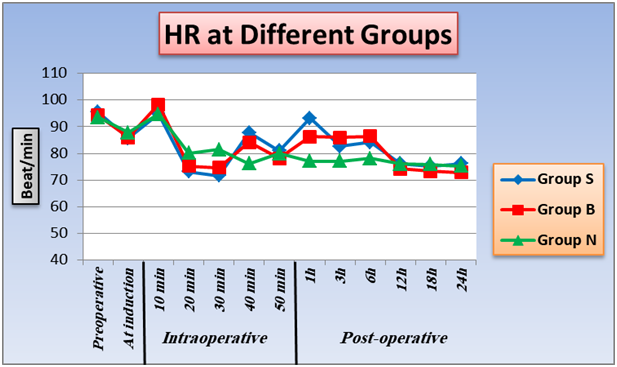 A significant changes between groups with each other at 1 hour postoperative as P value < 0.05 and group N was the lowest, then Group B, lastly Group S was the higher (Figure 1,2,3). Figure 1: Effect of TAB block and intrathecal nalbuphine on heart rate (beat/min): One way ANOVA test for parametric quantitative data between the three groups followed by post Hoc Tukey analysis between each two groups. Paired sample t test for quantitative data within each group. *Significant difference at p value < 0.05 #Significant difference in comparing with preoperative within each group, p value < 0.05. Figure 2: Effect of TAB block and intrathecal nalbuphine on systolic blood pressure: One way ANOVA test for parametric quantitative data between the three groups followed by post Hoc Tukey analysis between each two groups. Paired sample t test for quantitative data within each group. *Significant difference at p value < 0.05. #significant difference in comparing with preoperative within each group, p value < 0.05. Figure 3: Effect of TAB block and intrathecal nalbuphine on diastolic blood pressure: One way ANOVA test for parametric quantitative data between the three groups followed by post Hoc Tukey analysis between each two groups.Paired sample t test for quantitative data within each group. *Significant difference at p value < 0.05. # Significant difference in comparing with preoperative within each group, p value < 0.05. Figure 4: Effect of TAB block and intrathecal nalbuphine on Visual Analog Score. Kruskal Wallis test for non-parametric quantitative data between the three groups followed by Mann Whitney test between each two groups.Wilcoxon Signed rank test for qualitative data within each group. Figure 5: Effect of TAB block and intrathecal nalbuphine on analgesia duration, effective analgesia time. One way ANOVA test for parametric quantitative data between the three groups followed by post Hoc Tukey analysis between each two groups. *Significant difference at p value < 0.05. Figure 6: Effect of TAB block and intrathecal nalbuphine on total analgesic requirement (nalbuphine) in 24 hours. One way ANOVA test for parametric quantitative data between the three groups followed by post Hoc Tukey analysis between each two groups. One way ANOVA test for parametric quantitative data between the three groups followed by post Hoc Tukey analysis between each two groups. *- Significant difference at p value < 0.05. 5. Effect of TAB block and intrathecal nalbuphine on side effects: There is significant difference between group S and group N, also between group B and group N in nausea, vomiting and hypotension as number of cases lowest in group N with highest value in group S, as regard headache, no significant variances between groups was reported. (Table 3). Table 3: Side effects incidence in groups. 6. Effect of TAB block and intrathecal nalbuphine on patient satisfaction: Group N show best patient satisfaction while in group S, the worst patient satisfaction was detected (Table 4). Table 4: Patient satisfaction in different groups. A pain and stress free postoperative period brings about early mobilization and recovery thereby reducing the morbidity and mortality of any surgical operation. Pain results in neuroendocrine stress reaction and subsequent increased in sympathetic tone, catecholamine levels and catabolic hormone secretion. Shallow respiration and inadequate cough owing to pain can result in postoperative pulmonary complications. A control of these pathophysiologic progressions by receiving adequate postoperative analgesia together with intraoperative anesthesia may lead to improvement in morbidity with patient satisfaction. Both intrathecal nalbuphine and TAP block are used for postoperative analgesia. Intrathecal administered nalbuphine shows similar analgesic action as morphine but with lower side effects. TAP block is a widely used analgesic agent approved for decreasing post cesarean delivery pain. It was showed that concomitant use of TAP block along with IV opioid analgesics reduces both dose of IV opioids with reduction of adverse effects of intrathecal morphine including respiratory depression, pruritus, nausea and vomiting. Little or no previous reports held to compare between TAP block and intrathecal nalbuphine in regard of their postoperative analgesic action. Therefore, in the current stud, TAP block is assessed versus intrathecal nalbuphine in severe preeclamptic patients whom delivered with cesarean section. Aiming to record analgesic effects, reported side effects, haemodynamic changes in both agents for assessment and comparison. Significant increase in analgesic time duration of nalbuphine treated group (242.3 ± 24.4 min) as compared to control (81.3 ± 8.8 min) and TAP block (142.7 ± 18.9 min), also with significant increase of TAP group when compared with control group. Also effective analgesic time show significant difference between, nalbuphine, TAP and control group, (107.7 ± 11 min), (215.3 ± 15.9 min) and (320.3 ± 30.2 min) respectively. Total nalbuphine dose requirement in 24 hours (mg) was significant different between groups nalbuphine group (4.5 ± 0.9 min), TAP group (8.7 ± 1.3 min) and control group (18.3 ± 2 min) Patient satisfaction showed significant intensification in nalbuphine group and TAP group (P < 0.05) as compared to control group These results went along previous results of culebras et al, who reported that serial doses (0.2, 0.8 and 1.6 mg) of intrathecal nalbuphine used in combination with hyperbaric bupivacaine after cesarean sectionproduced good analgesic effect. In addition, he added that 1.6 mg intrathecal nalbuphine prolong post-operative analgesia to a lesser degree than we reported in our study but our study was superior in term of effective analgesic time than Culebras study. Effective analgesic time was 193 ± 77 min vs 320.3 ± 30.2 min pregnant females whom did cesarean section. This may due to that we use a higher dose of nalbuphine. Also they use 1.6 mg nalbuphin in 1ml saline mixed with 2 ml of hyperbaric bupivacaine 0.5% but we use 2.4 ml of hyperbaric bupivacaine 0.5% added to 0.1 ml (2 mg) nalbuphine. We notice that they give I.V paracetamol when VAS = 3 but we give I.V paracetamol just after patient discharged from operative room. But their study reported that intrathecal morphine provides higher post-operative analgesic time than intrathecal nalbuphine in their different doses. Doses of 0.8, 1.6, 2.4 mg intrathecal nalbuphine were reported to increase analgesia and lower VAS when compared with vehicle group in patients with lower abdominal surgery and orthopedic surgeries. The same result reported by Tiwari et al but by using smaller dose (0.2 and 0.4 mg) . Supporting the previous results, Ahmed et al concluded that significant increase in postoperative duration of analgesia compared with the vehicle-treated group in abdominal operation following administration of intrathecal nalbuphine in doses of 0.8,1.6 and 2.4 mg .The same results were obtained by both Kumaresan and Raj and Mukherjee et al who used 0.4, 0.8 mg of intrathecally nalbuphine in patients scheduled in optional lower limb surgeries and show significant analgesia prolongation. On the other hand, Verma et al concluded intrathecal nalbuphine 2 mg is effective in enhancing postoperative analgesia compared to bupivacaine alone or along with tramadol. Many comparative studies held between intrathecal nalbuphine and fentanyl showed contradicted results; Gomaa et al showed no significance difference in analgesia time upon usage of intrathecal fentanyl (25 ug) and intrathecal nalbuphine (0.8 mg) in patients had cesarean section, they give 0.8 mg nalbuphine diluted to 0.5 ml added to 2 ml of hyperbaric bupivacaine 0.5%, and this time is lesser than our result. However, A significant longer analgesia time was observed by Naaz et al when used diverse quantities (0.8, 1.6 mg) of nalbuphine compared to intrathecal fentanyl (25 ug), these contradicted results may be attributed to difference in the set of experiments. Other comparative studies were against intrathecal nalbuphine in the term of analgesia time when compared with either intrathecal buprenorphine and intrathecal clonidine respectively along with bupivacaine during gynaecological procedures. Mostafa et al also compared the analgesic properties and duration of 2 mg intrathecal against 50 mg tramadol in postoperative pain release after transurethral resection tumor of the bladder. They demonstrated that in both groups similar motor block, nearly equal analgesia, delayed first analgesic request and less analgesic supplement over the initial 24 hours from the operation. TAP block has been proposed to relieve the somatic pain component. Our results showed that TAP block significant increased analgesic time compare to control group, further studies showed the same result as our study. Tan et al performed a randomized double-blind controlled trial in which 40 women that performed caesarean delivery using general anaesthesia to receive TAP block or no block. In those who received the TAP block, 20 ml of levobupivacaine 2.5 mg/ml was deposited bilaterally into the transversus abdominis plane under ultrasound guidance and it was reported that TAP block increased analgesic time and decreased morphine intake after caesarean section when compared with control group. 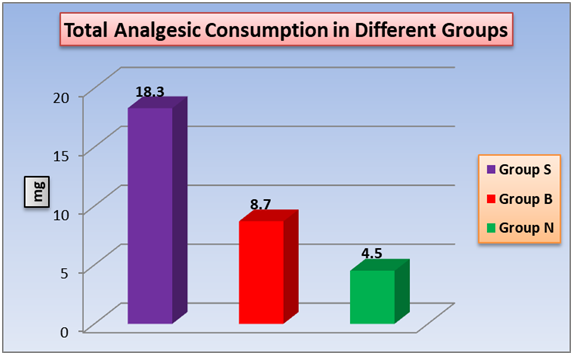 McDonnell et al reported that TAP blocks resulted in an impressive reduction in postoperative analgesic consumption. Their study differed from ours in that they did not use ultrasound guidance, their patients received a spinal anesthesia with bupivacaine 12 mg and fentanyl 25 mg bilateral TAP blocks were done consuming ropivacaine 3 mg/kg or a saline and their patients received intravenous morphine analgesia and regular rectal diclofenac and paracetamol. They reported a significant reduction in total morphine requirements. Another study by Belavy et al confirmed the usefulness of TAP block. They showed that ultrasound-guided TAP block with ropivacaine 0.5% in women performed caesarean section with spinal anaesthesia (bupivacaine 11 mg and fentanyl 15 mg) increased analgesic time and reduced 24-h morphine consumption when compared with saline, as part of a multimodal analgesic procedure which included postoperative paracetamol and NSAIDs. A randomized, double-blind, placebo-controlled trial was performed by Baaj et al on 40 patients performed cesarean delivery using spinal anesthesia with bupivacaine and fentanyl. By the end of surgery they received bilateral ultrasound-guided TAP block either with bupivacaine 0.25% (B group) 20 patients, or saline (I group), 20 patients and found total morphine intake was decreased more than 60% in the bupivacaine group; the bupivacaine group also detected good satisfaction with their pain break over 24 hours after surgery decreased morphine intake . In contrast, Costello et al performed a typical obstetric spinal anesthetic with long-acting neuraxial opioids (bupivacaine 12 mg, fentanyl 10 mg and morphine 100 mg) and reported that TAP blocks (20 ml of ropivacaine 0.375% on each side) did not decrease postoperative analgesia despite being part of a multimodal analgesic regimen. Far from disproving efficacy, their findings lent weight to the fact that intrathecal morphine is very efficacious at decreasing pain after caesarean section, lasting longer than the local anesthetic of the TAP block. As the TAP block provides analgesia only for somatic pain from the incision site on the anterior abdominal wall, visceral pain from the uterus can be addressed by other modalities. McKeen et al concluded that ultrasound-guided TAP block did not decrease postoperative pain or quality of recovery, they assessed the consequence of the addition of ultrasound-guided TAP with 0.25% ropivacaine to a multimodal approach. Supporting to McKeen results, Singh et al showed that neither high- or low-dose TAP blocks, as part of a multimodal analgesia regimen including intrathecal morphine, improved pain scores with movement at 24h after cesarean delivery when compared to placebo TAP blocks. However, High-dose TAP blocks may not significantly improve pain scores up to 12h following cesarean section. McMorrow et al concluded that spinal morphine but not TAP block improved analgesia after caesarean section. The using of TAP block with bupivacaine 2 mg/kg to spinal morphine showed no analgesic improvement. It is noticed that the clinical studies showed reduced TAP block efficacy in analgesia were performed in western society. The cultural background of our patients might have also contributed to low analgesic consumption as societal attitudes toward pain relief illustrate the complex interactions between cultural concepts of pain, pain relief and human behavior. Intrathecal nulbuphine and TAP block produce a significant prolongation in postoperative analgesic time and decrease postoperative analgesic consumption. However intrathecal nulbuphine showed significant advantages over TAP block. 1. American Society of Anesthesiologists Task Force on Neuraxial Opioids, Horlocker, T.T., Burton, A.W., et al. Practice guidelines for the prevention, detection, and management of respiratory depression associated with neuraxial opioid administration. (2009) Anesthesiology 110(2): 218-230. 2. Petersen, P.L., Mathiesen. O., Torup, H., at al. The transversus abdominis plane block: a valuable option for postoperative analgesia? A topical review. (2010) Acta Anaesthesiol Scand 54(5): 529-553. 3. Belavy, D., Cowlishaw, P.J., Howes, M., et al. Ultrasound-guided transversus abdominis plane block for analgesia after Caesarean delivery. (2009) Br J Anaesth 103(5): 726-730. 4. McDonnell, J.G., Curley, G., Carney, J., et al. The analgesic efficacy of transversus abdominis plane block after cesarean delivery: a randomized controlled trial. (2008) Anesth Analg 106(1): 186-191. 5. Tornero-Campello, G. Transversus abdominis plane block should be compared with epidural for postoperative analgesia after abdominal surgery. (2007) Anesth Analg 105(1): 281-282. 6. Tan, P.H., Chia, Y.Y., Lo, Y., et al. Intrathecal bupivacaine with morphine or neostigmine for postoperative analgesia after total knee replacement surgery. (2001) Can J Anaesth 48(6): 551-556. 7. Eisenach, J.C., Carpenter, R., Curry, R. Analgesia from a peripherally active kappa-opioid receptor agonist in patients with chronic pancreatitis. (2003) Pain 101(1-2): 89-95. 8. Dennis, A.T. Management of pre-eclampsia: issues for anaesthetists. (2012) Anaesthesia 67(9): 1009-1020. 9. Macintyre, P.E., Walker, S.M. The scientific evidence for acute pain treatment. (2010) Curr Opin Anaesthesiol 23(5): 623-628. 10. Makris, A., Thornton, C., Hennessy, A. Postpartum hypertension and nonsteroidal analgesia. (2004) Am J Obstet Gynecol 190(2): 577-578. 11. Saxena, A.K., Arava, S.K. Current concepts in neuraxial administration of opioids and non-opioids: An overview and future perspectives. (2004) Indian J Anaesth 48(1): 13-24. 12. de Beer, Jde.V., Winemaker, M.J., Donnelly, G.A., et al. Efficacy and safety of controlled-release oxycodone and standard therapies for postoperative pain after knee or hip replacement. (2005) Can J Surg 48(4): 277. 13. Culebras, X., Gaggero, G., Zatloukal, J., et al. Advantages of intrathecal nalbuphine, compared with intrathecal morphine, after cesarean delivery: an evaluation of postoperative analgesia and adverse effects. (2000) Anesth Analg 91(3): 601-605. 14. Eslamian, L., Jalili, Z., Jamal, A., et al. Transversus abdominis plane block reduces postoperative pain intensity and analgesic consumption in elective cesarean delivery under general anesthesia. (2012) J Anesth 26(3): 334-338. 15. Chaney, M.A. Side effects of intrathecal and epidural opioids. (1995) Can J Anaesth 42(10): 891-903. 16. Culebras, X., Gaggero, G., Zatloukal, J., et al. Advantages of intrathecal nalbuphine, compared with intrathecal morphine, after cesarean delivery: an evaluation of postoperative analgesia and adverse effects. (2000) Anesth Analg 91(3): 601-605. 17. Jyothi, B., Gowda, S., Shaikh, S.A. A comparison of analgesic effect of different doses of intrathecal nalbuphine hydrochloride with bupivacaine and bupivacaine alone for lower abdominal and orthopedic surgeries. (2014) Ind J Pain 28(1): 18-23. 18. Tiwari, A.K., Tomar, G.S., Agrawal, J. Intrathecal Bupivacaine in Comparison With a Combination of Nalbuphine and Bupivacaine for Subarachnoid Block: A Randomized Prospective Double-Blind Clinical Study. (2013) Am J Ther 20(6): 592-595. 19. Ahmed, F., Narula, H., Khandelwal, M., et al. A comparative study of three different doses of nalbuphine as an adjuvant to intrathecal bupivacaine for postoperative analgesia in abdominal hysterectomy. (2016) Ind J Pain 30(1): 23-28. 20. Kumaresan, S., Raj, A.A.M. Intrathecal Nalbuphine as an Adjuvant to Spinal Anaesthesia: What is Most Optimum Dose? (2017) Int J Sci Study 5(1): 57-60. 21. Mukherjee, A., Pal, A., Agrawal, J., et al. Intrathecal nalbuphine as an adjuvant to subarachnoid block: What is the most effective dose? (2011) Anesth Essays Res 5(2): 171-175. 23. Gomaa, H.M., Mohamed, N.N., Zoheir, H.A.H., et al. A comparison between post-operative analgesia after intrathecal nalbuphine with bupivacaine and intrathecal fentanyl with bupivacaine after cesarean section. (2014) Egyptian J Anaesth 30(4): 405-410. 25. Bansal, M., Agarwal, S., Gupta, K., et al. Clinical efficacy of clonidine versus nalbuphine as intrathecal adjuvants to 0.5% hyperbaric bupivacaine for subarachnoid block during gynaecological procedures: a double blind study. (2017) Int J Res Med Sci 5(6): 6. 26. Mostafa, M.G., Mohamad, M.F., Farrag, W.S. Which has greater analgesic effect: Intrathecal nalbuphine or intrathecal tramadol. (2011) J Am Sci 7: 480-484. 27. O'Connor, K., Renfrew, C. Subcostal transversus abdominis plane block. (2010) Anaesthesia 65(1): 91-92. 28. Tan, T.T., Teoh, W.H., Woo, D.C., et al. A randomised trial of the analgesic efficacy of ultrasound-guided trans versus abdominis plane block after caesarean delivery under general anaesthesia. (2012) Eur J Anaesthesiol 29(2): 88-94. 29. McDonnell, J.G., Curley, G., Carney, J., et al. The Analgesic Efficacy of Transversus Abdominis Plane Block after Cesarean Delivery: A Randomized Controlled Trial. (2008) Anesth Analg 106(1): 186-191. 30. Belavy, D., Cowlishaw, P.J., Howes, M., et al. Ultrasound-guided transversus abdominis plane block for analgesia after Caesarean delivery. (2009) Br J Anaesth 103(5): 726-730. 31. Baaj, J.M., Alsatli, R.A., Majaj, H.A., et al. Efficacy of ultrasound-guided transversus abdominis plane (TAP) block for postcesarean section delivery analgesia--a double-blind, placebo-controlled, randomized study. (2010) Middle East J Anaesthesiol 20(6): 821-826. 32. Costello, J.F., Moore, A.R., Wieczorek, P.M., et al. The Transversus Abdominis Plane Block, When Used as Part of a Multimodal Regimen Inclusive of Intrathecal Morphine, Does Not Improve Analgesia After Cesarean Delivery. (2009) Reg Anesth Pain Med 34(6): 586-589. 34. Singh, S., Dhir, S., Marmai, K., et al. Efficacy of ultrasound-guided transversus abdominis plane blocks for post-cesarean delivery analgesia: a double-blind, dose-comparison, placebo-controlled randomized trial. (2013) Int J Obstet Anesth 22(3): 188-193. 35. McMorrow, R.C., Ni Mhuircheartaigh, R.J., Ahmed, K.A., et al. Comparison of transversus abdominis plane block vs spinal morphine for pain relief after Caesarean section. (2011) Br J Anaesth 106(5): 706-712. 36. Brennan, F., Carr, D.B., Cousins, M. Pain management: a fundamental human right. (2007) Anesth Analg 105(1): 205-221.